Wise old curd nerds will tell you that it takes five years for a new cheese to really hit its stride. According to conventional wisdom, cheesemakers must first master seasonal changes in the milk before they can make a really good cheese. Conventional wisdom does not seem to apply to Julie Cheyney, owner of White Wood Dairy in Hampshire, however. Her lactic cow's milk cheese St Jude has just won the James Aldridge Memorial Trophy for Britain's best raw milk cheese, despite only being launched a year ago. The St Marcellin-style cheese has a lemony flavour and moussey texture when young, but develops into an earthy little bombshell in a basket as it matures, which belies its dainty appearance. I've been a huge fan since day one, as have Cheyney's fellow cheesemakers – the James Aldridge award is voted for by members of the Specialist Cheesemakers Association. 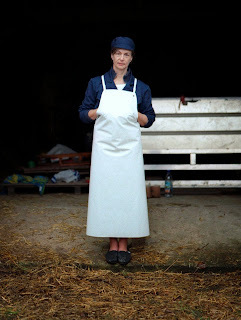 Her cheese is made with raw milk supplied by Sam Martin - a dairy farmer in Hampshire. His cows are an unusual cross between Holstein, Friesian, Swedish Red and Jersey breeds. The milk they produce has its own unique character and was just what Cheyney needed to get back into cheese making.